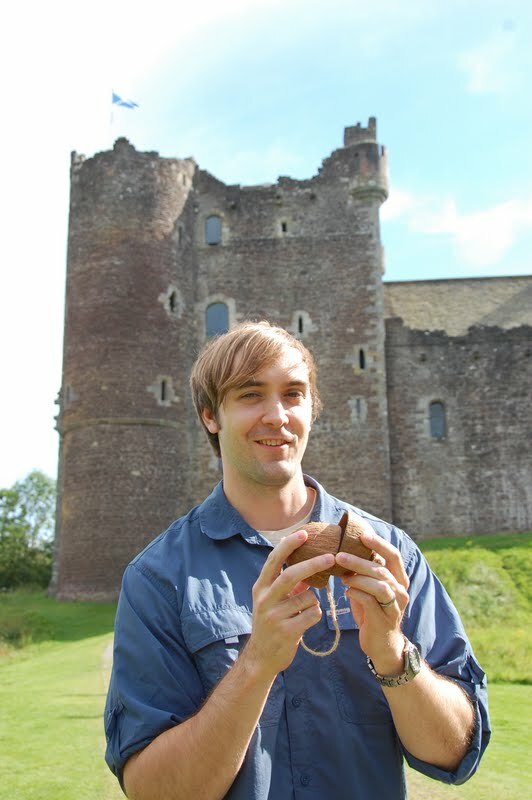 Scotland is an amazing place with a wonderful balance of picturesque landscapes and culture-filled cities. We spent a week there, breaking it up into a few days in the Highlands and a few days in Edinburgh. We were really excited to visit Scotland since some of our best friends in Frankfurt hail from there and have talked it up immensely. The Edradour Distillery - our first stop outside of Pitlochry, Edradour is the smallest whisky distillery and only independently owned distillery in Scotland. We're not big scotch drinkers, but it's always neat to have a wee tour of a production facility and have a wee taste of the product. It really was a tiny little place, producing what a large distillery makes in a week......in the course of an entire year! A fine example of Scottish engineering. This water pump has been used since the 1800's! 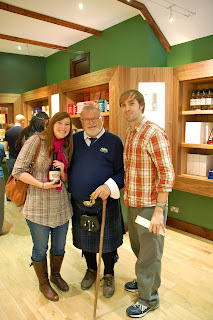 Our tour guide was a hoot and served as a fine welcome to Scotland. Rated the best pub in Scotland by Lonely Planet, and by some of our friends, we stopped in at the Moulin Inn for a pint. It had a great atmosphere and we only wish we could've stayed longer, but we had to make it up the road to Inverness that day. Loch Ness - the U.K.'s largest body of water by volume. 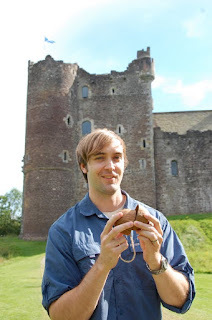 We enjoyed driving around it for an entire afternoon and of course, visiting the Loch Ness Visitor Center with a history of the sightings of the Loch Ness Monster and the resulting scientific expeditions. 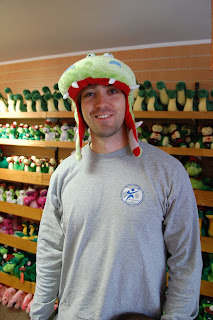 Sporting my "Nessie" hat at the Loch Ness Visitor Center. Scotland did an amazing job marketing all of the things that they're known for and I took it hook, line, and sinker! I mean besides this example they had everything plaid, cds with the bagpipes, Walker's shortbread, Scotch whiskey, William Wallace swords, highland cattle stuffed animals, golf stuff, etc. My first experience driving on the left side of the road on the right side of the car. I was eased into the experience by having an automatic transmission and it surprisingly wasn't too difficult to adjust. The trickiest part is remembering which way traffic should be coming from which lane. And "yes" everything is reversed, which means that the fast lane is the right lane. By the way, here I am sampling Walker's shortbread which is made of probably 85% butter. It was money! 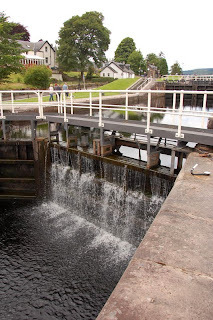 The Caledonian Canal - it was built in the early 1800's to allow ships to pass through Scotland rather than navigate the tumultuous waters around the northern part of Scotland. There are dozens of these locks that raise and lower ships along the way. Fort Augustus - same portion of the Caledonian Canal as shown above, but Marisa really likes this picture because you can see a ship approaching and the different levels of water. We didn't watch the boat come up because it was time for an Irn Bru break! Irn Bru - Scotlands #1 selling soft drink. Scotland is reportedly the only country that has a soft drink that outsells Coca-Cola. It's an acquired taste that hits you initially with the sweet flavor of bubble gum and leaves you with a feeling of superhuman strength. The name reminds me of something that a high school student might come up with......like SWAT Juice!! Sadly Irn Bru is not for everyone! We absolutely loved the scenery in the Highlands. Culloden Battlefield - Site of the last battle fought on British soil in 1746 between the Scots loyal to Bonnie Prince Charlie (Jacobites) who wanted to claim the throne and restablish the monarchy of the Stuarts and the English that wanted to maintain the Hanoverian reign. The Jacobites lost the battle miserably and the English initiated a series of laws designed to eliminate Scottish culture (ex: wearing kilts, playing bagpipes, drinking Irn Bru etc). Re-enacting a likely scene from the battle as I climb over the wall ready to claw someone's eyes out. Memorial stones placed in Culloden memorializing the brave clans that fought and died here. Monument to all of the Scots that died at Culloden. Clava Cairns - prehistoric rock structures built for some sort of religious festivities based around the solstices. The U.K. is covered with these mysterious sites such as Stonehenge. Marisa in the ring cairns. Inverness - the northernmost city in the Highlands. It was a lovely place to stay for a couple of days as a starting point for day trips in the Highlands. Inverness Castle - currently used as a courthouse. William Wallace Monument - memorializing Braveheart's victory against Edward I's army at the Battle of Stirling in 1297, it's basically a huge tower on top of a big hill right next to the site of the battle. Unfortunately we weren't able to get a better picture from a distance. 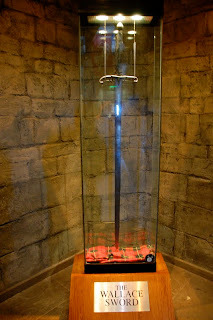 My highlight was climbing the tower to catch a glimpse of this bad boy - the Wallace Sword. It's been authenticated by multiple historians that this is the sword carried by William Wallace who is said to have stood 6'4" tall - much taller than Mel Gibson portrayed. Marisa sports the old Scottish flag in front of Stirling Castle. Nature shot of a duck taking a sip of water. Hairy Coo Tour - many companies do day-trips to the Highlands from Edinburgh. This one was free (with an encouragement to tip what you thought it was worth). We had an enthusiastic guide and learned a lot about Scottish history. Highland Cattle, or "Hairy Coo" as they're locally known. This was by far Marisa's favorite part. Hamish, the most famous hairy coo. He was actually pardoned by the Queen a few years back when all of the cattle above a certain age were condemned to be put down due to some sort of outbreak of Mad Cow or something like that. You wish this picture had audio because I nailed the sound of horse hooves with a coconut shell. We had amazing weather and Scottish Heather was all over the place. I can't recommend the Scottish Highlands enough for those that want a bit of the outdoors to go along with their European vacation. It was lovely and I would definitely return.